Alex Welsh against Colorado Christian Jan. 16, 2016. 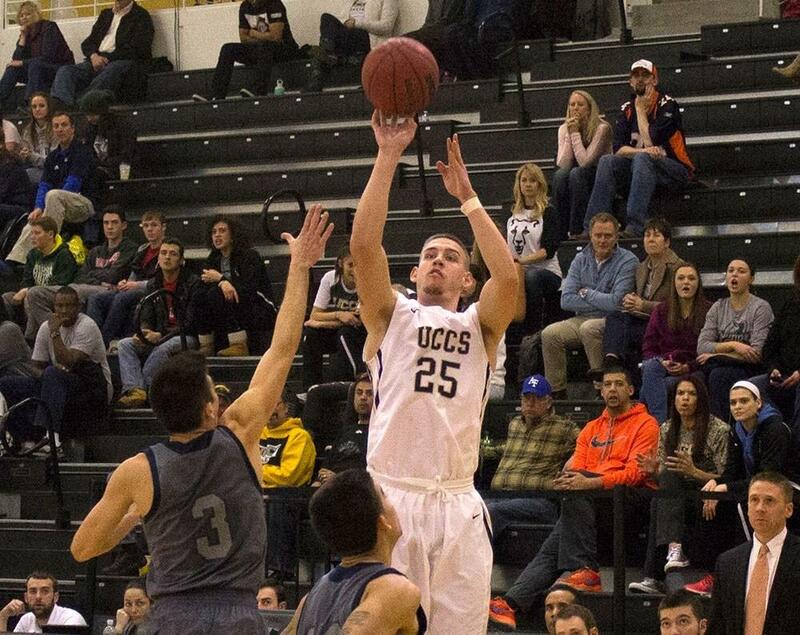 UCCS men’s basketball alumnus Alex Welsh will have his No. 25 jersey number retired during a ceremony on Friday, Feb. 8, during the Mountain Lions basketball doubleheader against MSU Denver in Gallogly Events Center. The women’s game against the Roadrunners will start at 5:30 p.m., with the men’s game to follow at approximately 7:30 p.m. Immediately following the women’s game, Welsh will have his number retired and hung from the south end of Gallgoly Events Center, next to teammate Derrick White (2012-13 to 2014-15). White, who is currently a starter for the San Antonio Spurs, had his No. 14 retired last February. The all-time scoring leader and all-time rebounding leader in program history, Welsh played for the Mountain Lions from 2012-13 to 2015-16. A four-year member of the program, he played in 117 career games and recorded 1,947 points and 884 rebounds. He received his business degree from UCCS in May 2016. A 6-foot-7 forward from Westminster, Colorado, and a product of Pomona High School, Welsh earned Division II Bulletin All-America Honorable Mention accolades in 2016. A Division II Conference Commissioner’s Association and National Association Basketball Coaches All-South Central Region team selection, Welsh competed in the Reese’s Division II All-Star game in 2016. He was named to the All-Rocky Mountain Athletic Conference First Team in 2015 and 2016, and All-RMAC Second Team as a sophomore. He helped the Mountain Lions win their first RMAC Tournament Championship in 2015 and was named to the RMAC All-Tournament Team in 2014 and 2015. Welsh nearly averaged a double-double during his career. His 16.6 points per game is the fifth highest scoring average at UCCS, and his 7.6 rebounds per game is the third highest. As a senior, Welsh tallied 688 points and 292 rebounds, the second most by any Mountain Lion in one season. He also dished out 223 assists, ranking him sixth all-time at the time of his graduation. He scored a career high 41 points on Jan. 20, 2016, against New Mexico Highlands University, the sixth most ever in a game. On two different occasions, he pulled down 17 rebounds, ranking the sixth most recorded in a single game. The basketball doubleheader on Feb. 8 is also the Mountain Lions annual “Black Out” night. The first 1,000 UCCS students to the games will receive a free “Black Out” t-shirt.